There are more than 140,000 species of butterflies and moths in the world, fluttering on every continent except Antarctica. Their wings contain countless patterns and colors, providing critical tools for camouflage, finding mates and scaring off predators. A Bay Area professor is trying to learn more about how those colors develop and evolve – by going very, very small. Nipam Patel, a professor in the Molecular & Cell Biology Department at the University of California, Berkeley, studies the thousands of tiny cells, known as scales, on butterflies’ wings. 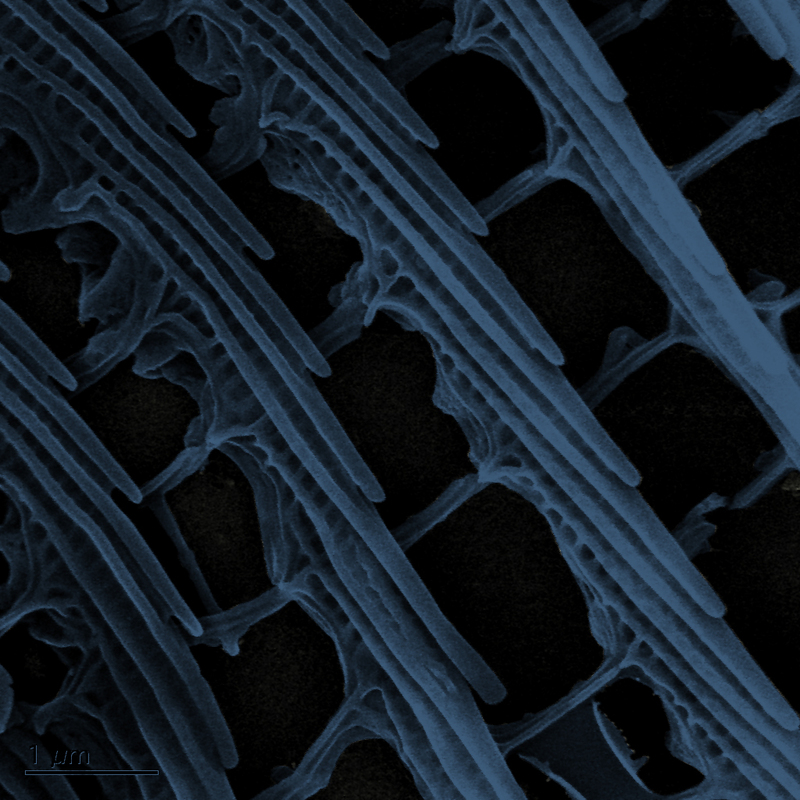 From a distance, the rows and rows of scales look like vivid patterns that decorate a butterfly's wings. But up close, each scale is like a dab of paint in a Pointillist painting or a tile in a mosaic; they represent an individual unit of color. "Each scale is...a single cell, and as far as cells go, they are huge, much larger than the typical cells in our bodies," says Patel, who also works in Berkeley’s Integrative Biology Department. "A human blood cell is about 10 microns in size -- a pretty typical size for a cell in our bodies. A butterfly scale is...a huge one, about 50 microns across and 200-250 microns long." 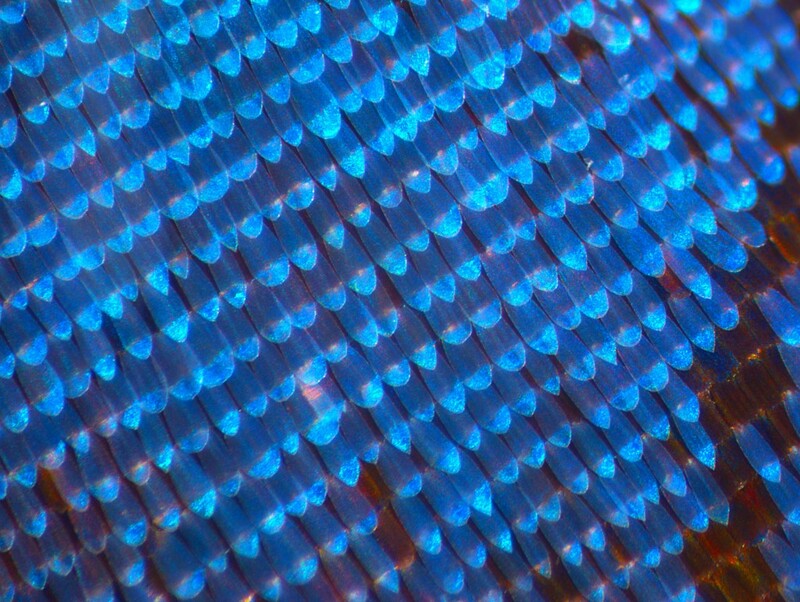 Some butterfly scales are colored by pigments. But others rely on something called “structural color” -– the production of color by nano-sized elaborate shapes that reflect and bend light. Structural color is why we perceive the Morpho butterfly, a dazzling type of blue butterfly found in South America, Mexico and Central America, as bright blue, along with peacock feathers, iridescent beetles and blue eyes. 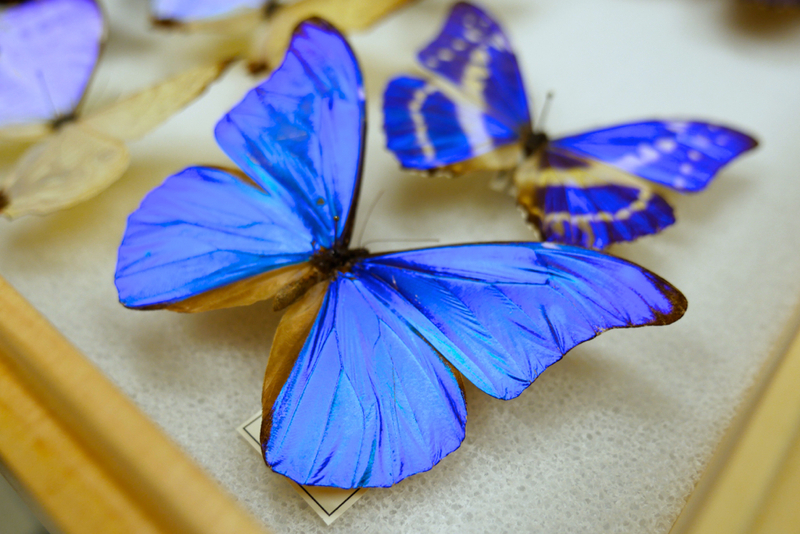 "Blue is one the rarest colors made as a pigment," notes Ryan Null, a graduate student in Patel's lab. "Most animals can't produce blue pigments." 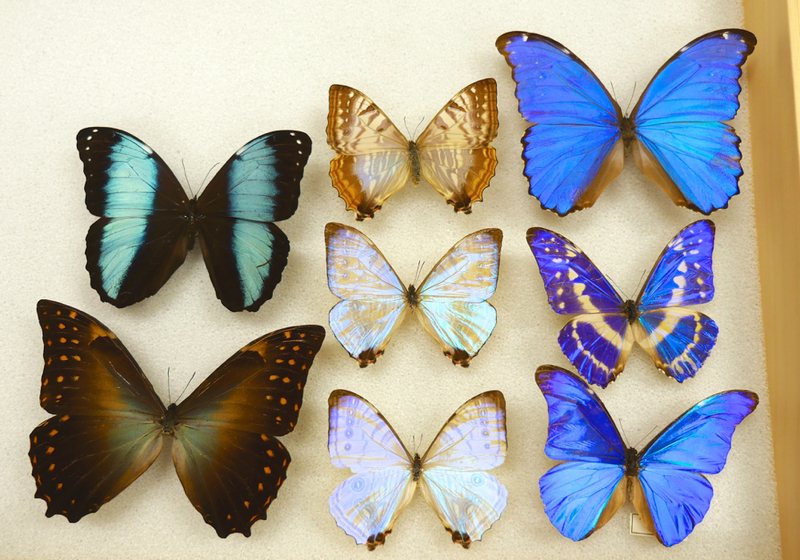 One area of ongoing research in the lab centers on structural color in butterflies as it relates to evolutionary developmental biology. The researchers are working to understand how nanostructures in butterflies’ wings are built during the third stage of a their life cycle, known as pupal development. Patel and Null wanted to observe how structural color takes shape on the wings. Because this normally occurs inside a Morpho's opaque pupa and isn't visible, they remove wings from pupae, grow them in a Petri dish, then study the process. Like developing a photograph or brushing paint on a blank canvas, colors and patterns slowly appear on the ghostly white wings over time – as shown in short time-lapse movies they've filmed of several different butterfly species. The scientists, who use high-powered microscopes to study their subjects, hope that by focusing on the very tiny, their research could be applied in innovative ways in the future. "What's cool about this work is that in contrast to the way people currently mimic naturally occurring structural colors -- by using industrial processes deposit layers of heavy metals by electricity that's expensive and energy-intensive -- butterflies and moths have evolved a way to create these stunning colors with a string of sugar molecules," says Null. "They appear to be the basic components of all animal cells. The genetic program controlling the creation of the nanostructures is elegant, robust and done in a way that is not hazardous to the life of the animal. If we can figure out how the butterflies do what they do, we have the potential to apply what we learn to a vast array of problems like creating cars that have their "paint" grown from the surface of their sheet metal, vivid cosmetics that are inherently safe for use with minimal testing, and even making solar cells more efficient."